This has been a feature request for nearly as long as Safari has existed—Safari was released in January 2003, and I found this MacRumors forum thread from April 2003 asking how to sort bookmarks. So this feature was nearly 15 years in the making! …there was no such option available. Stumped for a moment, it struck me that there may be a limit on the number of entries, as that was the only difference between this folder and others. I removed half the entries, leaving 546, but still, no Sort entry in the contextual menu. After a bunch of back-and-forth moving (which takes some time, when you move hundreds of bookmarks around), I found the limit: 450 entries. 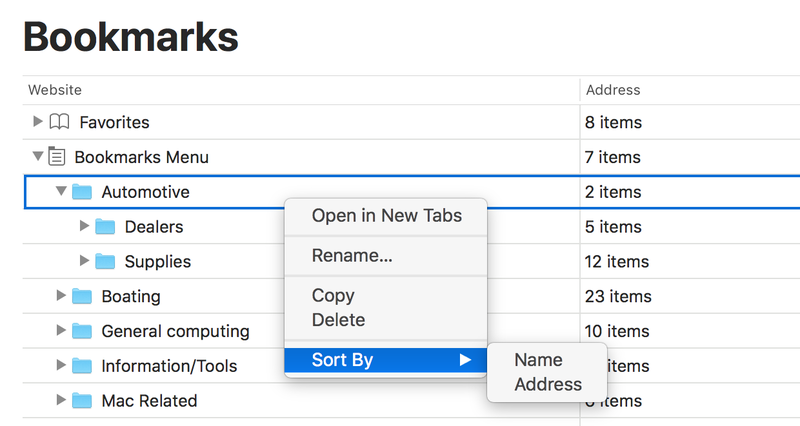 So if you have a large folder of bookmarks in Safari that you need to sort, you’ll have to split it into multiple folders, none of which can have more than 450 entries. Weird but true. I know there are tons of third party tools that can do this—I’ve used many over the years. But I much prefer a built-in solution, and was just very surprised to find it had a hard item count limit!